Suitable for students aged 8-12. 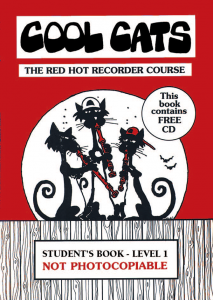 The Cool Cats Recorder Course is a 3 part sequential teaching and learning program. Both teacher and student books are available, and both include a free CD. A wide range of engaging genres are covered- rock, rap, funk, country and western, classical, trad jazz, folk, soul, R&B, blues, ragtime.